Having never tasted a mead before, I decided to make my own. I searched the internet for a plain old textbook mead recipe but was surprised to find that most recipes are flavored with additional fruits or herbs (later, I learned that this is because honey and water alone don't contain all the nutrients yeast need to thrive). Not knowing this, I attempted to aggregate all the recipes I had found into a sort of mean honey to water ratio and ferment that but then I spotted a bag of dried hibiscus flowers during a walk through the grocery store and decided to go with Jack Keller's hibiscus mead recipe. Jamaica the beverage is delicious, so it followed hibiscus mead would be, also. The acid blend proved too strong (maybe citric is weaker). I added it all at once, bringing the pH down to 2.69. As a result, some of the ingredients had to be increased from the original recipe to raise the pH (more water, more honey, more nutrient). The nutrient seemed to make the biggest difference. If the Pasteur Champagne is as robust as sources say, care will need to be taken to prevent excessive fermentation. Hopefully, the extreme acidity will keep it in check. In the future, however, the safest way to adjust pH is by calculating the expected amount required, adding half of that to the liquid, and then measuring again. Since my primary fermenter is in use at the moment (loquat wine), I used an empty 3-gallon carboy as a primary for the mead. I inoculated the must with Champagne yeast. Agitated must. There is a layer of opaque liquid over semi-translucent liquid. Tiny champagne-like bubbles are present. Agitated must. The must is all opaque now. Tiny bubbles continue rising. 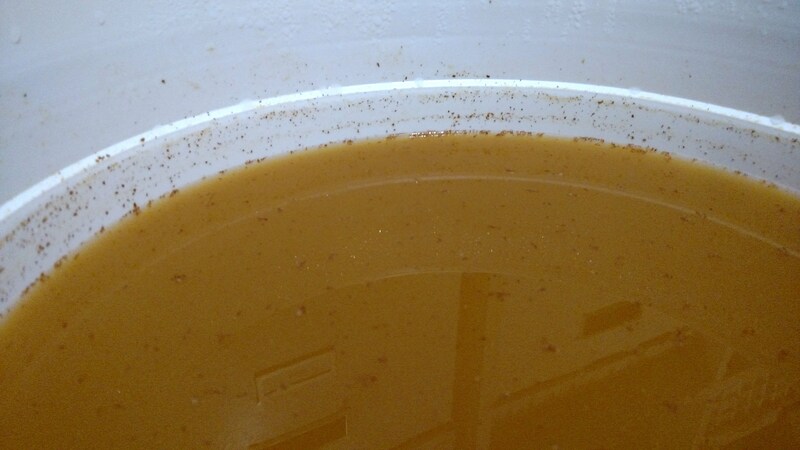 The fermentation is not nearly as vigorous as the loquat wine in the nearby primary. There are no longer bubbles visible but air occasionally is released through the airlock. I measured the pH at 3.06. I dissolved 6 grams (about 1.5 tsp) calcium carbonate in a pint of distilled water and added about two thirds of that solution to the mead and stirred. The final pH was 3.35. Jed is not thrilled about the chalky flavor but that should precipitate over time. I racked it into the secondary and topped it off with about a half gallon of distilled water. There is still some room at the top--I need to select a nice sweet white wine to blend with. Since I only have one 3-gallon carboy, I racked the mead into a 5-gallon carboy, sanitized the 3-gallon, then racked it back into that. It tastes complex--sweet, unique fermented honey flavor is very pronounced, hibiscus flavor is subtle, alcohol content feels mild on the palate. I topped it off with a bottle of 2011 Apothic White, which was fairly sweet as well. I'll need another white wine--the carboy is not completely full. I filled the remaining airspace with argon. Since the fermentation stopped at a relatively low ABV, and I had an extra pack of Premier Cuvée from making mead at Gavin’s house, I started up some yeast in a cup of warm water, a pinch of nutrient, and a splash of organic sour mix, then added it to the carboy. Fermentation picked up again and the airlock is bubbling regularly now. Fermentation slowed considerably by this point but small amounts of tiny bubbles are still rising to the surface. There is no visible activity but air is pushing outward against the vodka in the airlock, so there is marginal fermentation taking place. I racked the mead off the lees into a new carboy. Absolutely delicious! The hibiscus flavor is not very apparent but it still tastes great. We bottled the mead and stored it on the shelf to age.